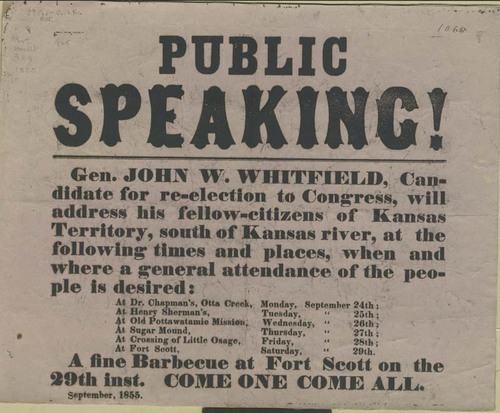 This broadside listed six places where John W. Whitfield planned to speak during his campaign for reelection as the delegate to Congress from Kansas Territory. Whitfield was a proslavery supporter. The speeches were to be given between September 24 and September 29, 1855. He planned to speak at Dr. Chapman's, Otta Creek; Henry Sherman's; Old Pottawatamie Mission; Sugar Mound; crossing of the Little Osage, and Fort Scott. A barbecue was scheduled for Fort Scott on September 29. People - Notable Kansans - Whitfield, John W.